Brunch was wonderfully relaxed. O had just returned from ten days in Sardinia, and was looking outrageously tanned in a crisp white shirt. We all started with lovely freshly squeezed juices. 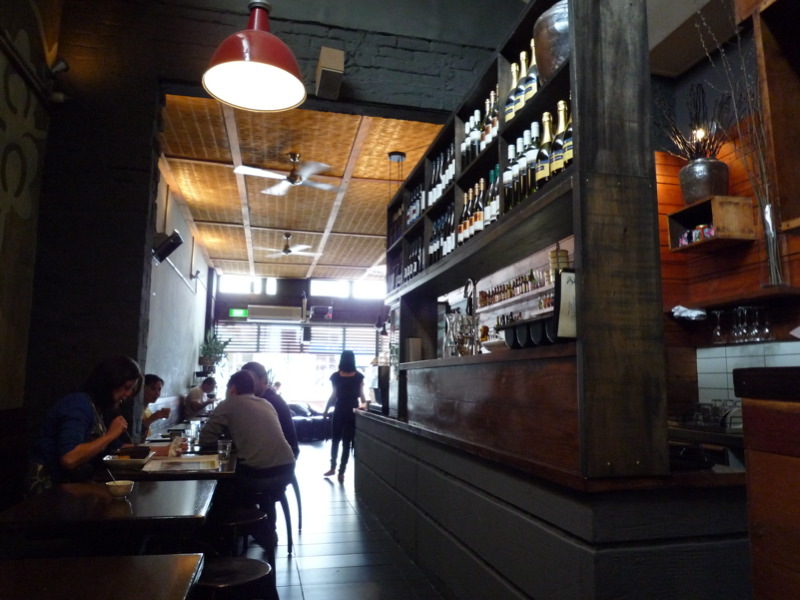 I'd heard plenty of good things about Tom Phat (particularly their breakfasts), but previously had only ever been in there for coffee and cake. I love the way the interior design mixes polished concrete surfaces and industrial light fittings with languid Graham Greenesque ceiling fans and bamboo ceilings. 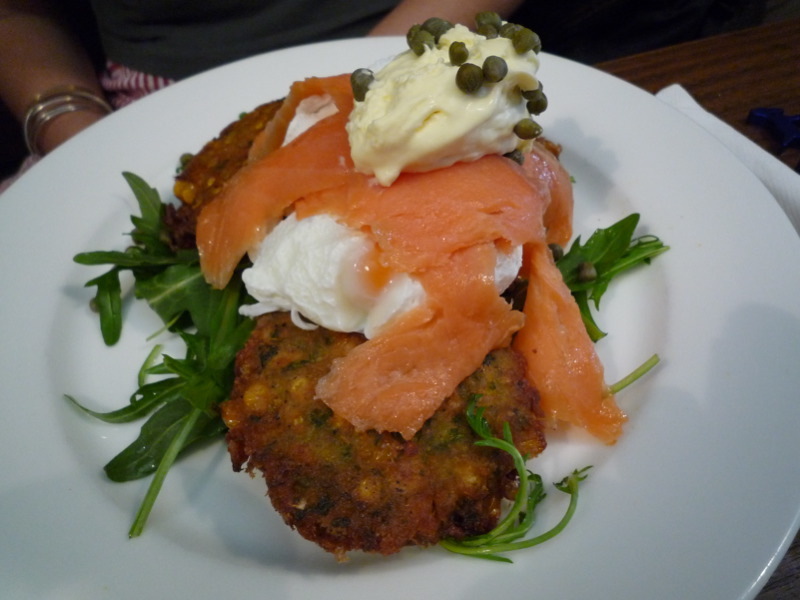 Schatz had the sweet corn fritters with poached egg, smoked salmon, capers, rocket and crème fraîche ($13.90). She gave me a taste - they were delicious, right up there with the ones I love so much at Mart 130. The capers were an especially nice touch. A had the big breakfast: poached eggs, crispy bacon, roasted tomatoes, grilled mushrooms, avocado, minus the hollandaise but plus hash browns ($14.90 + $3). 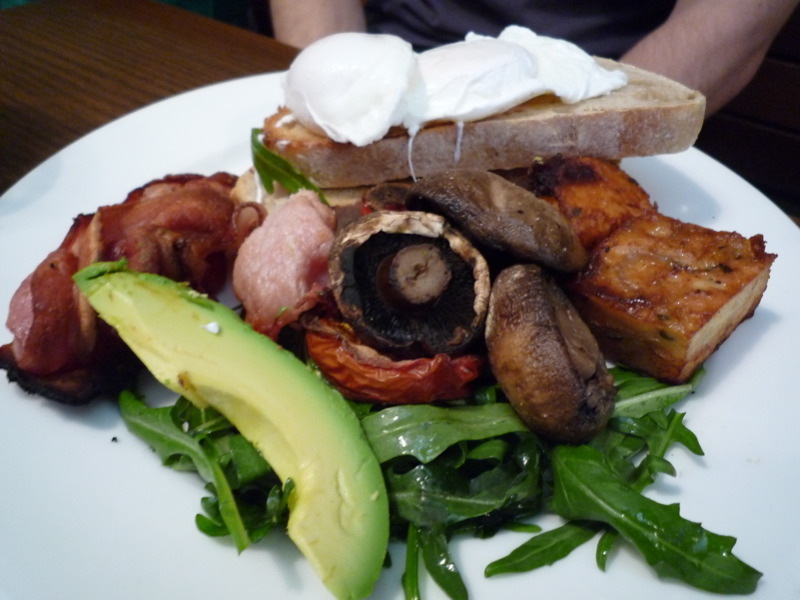 He reported back to us very favourably, noting it was nice to order crispy bacon that actually comes out crispy. As for me, I wanted to try one of the several breakfast dishes at Tom Phat that had a tropical Asian spin on them. I was tempted by the Sri scrambled eggs (with spring onion, curry leaves and cherry tomatoes and crispy roti), the Viet eggs fried (with chilli soy and spring onion) and even Uncle Ho's breakfast (grilled marinated pork chop, crispy fried egg, tomato, cucumber and rice). 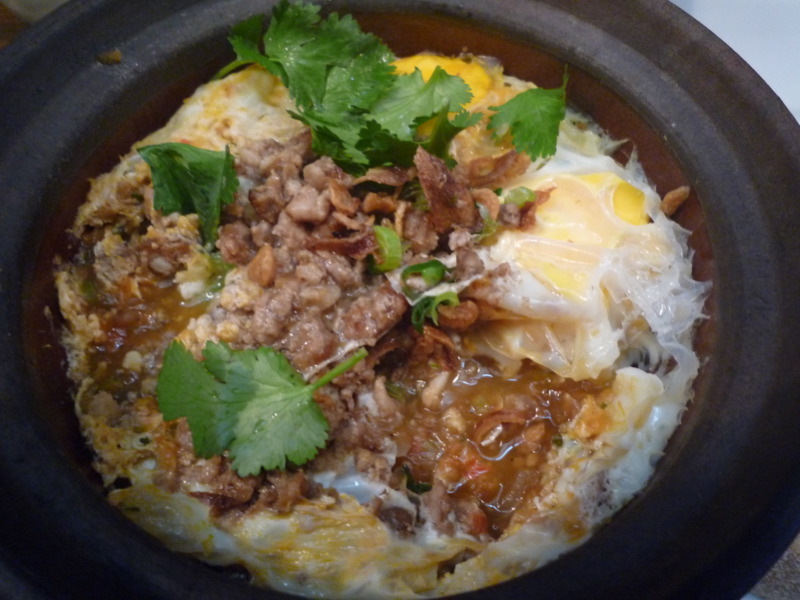 But in the end both O and I selected the clay pot baked eggs, with roasted tomato, caramelised onion and sweet tamarind minced pork and served with a hunk of crusty bread ($11.90). I loved it - the tang of the tamarind gave the dish a real lift, and matched the acidity of the tomato and the sweetness of the onion beautifully. I know the photo doesn't make the dish look especially appetising, but in this case looks are most certainly deceiving! When I got to work today and told C about the brunch, she practically smacked me for not trying her favourite dish at Tom Phat: the roti omelette (wok-tossed with bacon, chives and roasted tomato salsa). She orders it fortnightly! The roti omelette is pretty amazing and I find it hard to go past it on the menu too! If that pun is too embarrassing to publish, I understand. My favourites are the corn fritters and roti omelette! I've recently went to Tom Phat after not being back for about a year, and was REALLY disappointed that the quality of cooking has become beyond recognition. I highly suspect a change of chef to be the culprit.